After being a part of the homeschool lifestyle for nearly three decades, I have a limited capacity for questions regarding socialization in homeschooling. I can still hear the words ringing in my ears as a five-year old during the late eighties when people thought that was the greatest problem homeschoolers would face. And wouldn’t you know it? I still hear the big S word drug out from time to time. I do a mental face palm every time I hear it. Never mind the fact that I am a pretty social Homeschool graduate out in the big scary public with my Homeschool Littles while we get these questions. Despite being bullied during my growing up years I have become a very social person in my adult years. We were usually so busy with homeschool activities that staying home to do school was the real challenge. We aren’t in the eighties anymore. It is a shock to me that homeschoolers are still getting this question for more than one reason. Socialization happens everywhere we go. There are so many places in the world to socialize besides school. In fact attending school might be the only time in a person’s life that they are segregated by age all of the daylight hours fall through springtime. Because I was around people of all ages I learned to socialize with both adults as well as kids younger than me. This ability to socialize with others who aren’t exactly the same age as I was turned out to be extremely useful throughout my adult years. How many places are there to socialize as a homeschooler? Church, the library, the grocery store, the park or with your extended family. Depending on where you live there are many homeschool classes, sports and co-ops you can be a part of. Especially in my years as a homeschool high schooler we struggled to be at home doing school most days! There is so much socialization happening each and every day, my guess is you didn’t stop being social when you graduated high school? Me either. Now we all know a few homeschoolers that seem weird, I won’t even say it’s a complete myth, the weird homeschool kids are out there! But don’t we all know some interesting people who went to public or private school also? I know I do and honestly it’s about 50/50 on whether or not they jumped on the bus or stayed home for their education. There are some people who are just introverts and aren’t comfortable being around people, it won’t matter where they go to school! Socialization isn’t the highest priority. 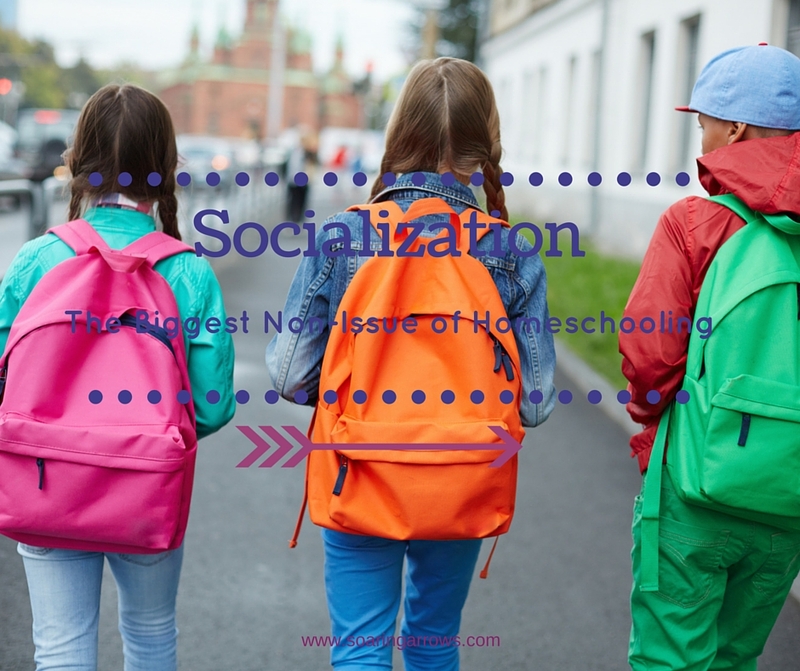 Just consider for a moment, is socialization really the reason you send your kids to school? Really? To be socialized? I thought it was to make sure they are properly educated. Oh it is? Well in that case I guess we are both on the same page. I also care about my kids getting the best education and whether or not they fit your standard of socialization is actually very small on my priority list. In fact based on the direction culture is headed I might be thrilled to have my kids be well-educated, filled with character and misunderstood by society. I would give myself a big pat on the back now that I think about it. Teaching my kids to be character filled contributors in this world is my highest priority. You can accomplish this goal no matter where your kids go to school however there is a good chance socialization will have little to do with whether or not you reach that goal. Forced Socialization doesn’t build confidence. You will find this on either side of the fence: public, private or homeschool. Stories where kids were bullied or teased mercilessly, were still subjected to it year after year, even as it crushed their self-esteem. I know staying home during my school years was exactly the confidence boost I needed to grow into a confident adult and I am thankful my parents gave me the chance. Last year I got Dreaming Daughter involved in American Heritage Girls. She was extremely shy when she started even though she has been involved in other classes and activities for the last 3 years. She is still incredibly soft spoken but last year I saw her blossom under the guidance of her troop leader. I will always give my kids opportunities to blossom but I did not stand there and force her to talk to other girls. It just began to happen naturally as she felt comfortable with her troop leaders and the girls who were a part of it. Comfort with her surroundings allowed for enough confidence to stand in front of her troop and present her badges she had earned. Even if we could barely hear her quiet voice, she was in front of the girls and leaders talking! It was a wonderful moment for me as her Mom to see her grow in her capacity to speak up. If I had put her in a situation that was uncomfortable and forced it would have led to even more insecurity. If I desire my arrows to soar, they need to feel secure in themselves and their environment! There are bigger Homeschool challenges. I would never say that homescoolers don’t have any challenges to work through. Like how to survive spending every day with our kids 24-7. Or how to read aloud and educate with a toddler or baby in the family. How to capture a child’s heart as well as their mind. Getting a child resistant to learning interested in learning. Homeschooling while dealing with a chronic illness or depression. Keeping marriage a high priority during the school year. Teaching a child with learning disabilities. Fighting discouragement when family and friends are unsupportive. Struggling through isolation when friends don’t talk to you about how homeschooling is going. If people really want to help homeschoolers with socialization, maybe enter their world and ask them how things are going? We also have kids learning and are excited to talk about it, just like parents with kids in school! There are many challenges homeschoolers do face, but more often than not, socialization simply isn’t one of them. Any of these challenges can be overcome but it’s important we don’t get distracted by issues that simply aren’t issues. Let’s focus our energy on building security in our little ones. Handle each challenge as it comes. And shove the non-issues where they belong! Loved this post. I think it’s absolutely ridiculous that people don’t think homeschoolers get socialization. As a former homeschooler I can’t remember a time in my life where I wasn’t around people. However most of the time I prefer spending time with people older than, but that’s just me and I don’t think that it’s a bad thing. Keep writing mama. Your posts encourage me. Yes I completely agree! I used to joke that I had more friends who weren’t my age than friends who were my age, and it was completely true. I am still thankful for that! Thank you for your encouraging words! Love it! So tired of hearing the S word. We briefly visited a local elementary school, and none of the kids were allowed to talk practically anywhere. So much for the much vaunted socialization! As another former homeschool graduate, I have to say that I did fine in college and interacting with adults – my personality is something of a hermit, but you can’t blame that on socialization. Thanks for reminding me not to worry so much about my kids. That is interesting that the kids in school weren’t able to talk to each other much! How sad! And yes I know a few hermit type personalities myself who wouldn’t have been one bit changed no matter where they were in school. Enjoy each child’s unique personality! Really that statement should be the end of it! Right?! Great post MJ will be sharing!